Juki, the leader in industrial sewing, now delivers high technology to your home with the new F-Series for sewing and quilting. This machine will exceed your expectations by combining power and reliability with all the features even a pro will love. Get professional results with the sleek, easy to operate, multi functional design developed for superior quilting, home decor and garment construction. 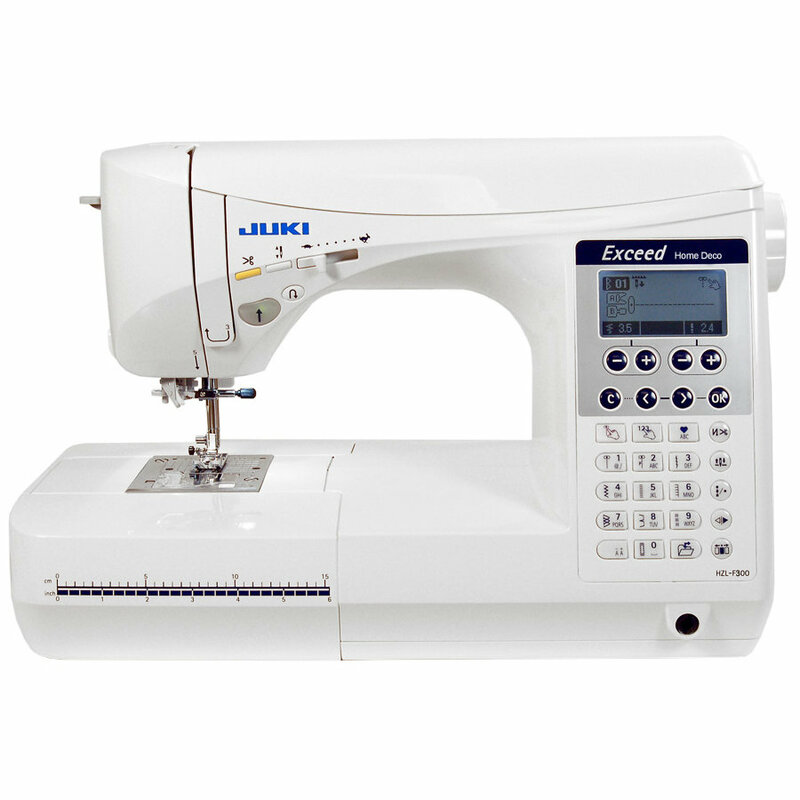 Take advantage of Juki's many years of industrial sewing expertise and expand your horizons with the Juki HZL-F300. Frequently used stitch patterns can be selected directly through the Direct Select mode. Piecing, Applique, Blanket stitch for applique, Overlocking, Invisible Hemming, Stretch Stitch and more all at the touch of a button. Stitch settings, patterns and recommendations for the best presser foot can all be seen on the machine's LCD screen display. The keypad allows you to quickly and easily select lettering and to adjust settings. Stitch can be adjusted with just the turn of a dial! Combine decorative stitches and lettering into new sequences. You can save up to 70 patterns! You can program the needle up/down position, automatic thread trimming, and foot control trimming with just the push of a button. Also set the contrast of the LCD screen, change the volume of the machine buzzer, select from 8 different language settings, and use the on-board sewing guide when you need a little help. Industrial Sewing Machine Technology in order to provide beautiful seams and outstanding feed performance, JUKI adopted the box feed system. The conventional feed mechanism is oval motion. On the other hand, the box feed moves the feed dog in a box motion. This eliminates material shrinking and shifting. This accurate feeding system provides superior stitch quality for a variety of light to heavy weight fabrics. Thick fabrics can be sewn with ease. Leather, denim, and canvas are no problem for this machine. No fabric shrinkage even while sewing on extra lightweight materials. Using a unique sensor method, HZL-F series sews beautiful buttonholes regardless of the type of material and overlapped sections. 16 types of buttonholes are available for your needs. Now it is possible to adjust the cutting width of the buttonholes in 3 steps. HZL-F series trims both needle and bobbin threads automatically by pressing the heel side of the foot controller. It is also possible to trim threads with a button located at machine body. With this feature you can concentrate on your project while automatically cutting the thread! The Exceed series now has a feature that allows you to move the position of a complete pattern without changing the width, as well as variable needle positions that allows you to place the needle anywhere you want. 90 Days Adjustments on Defects in Material or Workmanship.